A Safari in Uganda that incorporates visiting Rwenzori National Park offers a memorable as well as rewarding experience however so as to have a great time your safari should be well planned in advance. The central hike-circuit can last for approximately 6 nights and 7 days and leads to an altitude of 14 000 feet (or 4,267 meters) above the sea level. The Conditions on the mountain are really challenging even to the experienced hikers since mountain Rwenzori is renowned for its steep, slippery trails with regular rainfall plus cold temperatures, high altitude, fog, steep terrain as well as muddy. The dry period season starts from July to August and from December to February and therefore it’s somewhat dry for the inexperienced climbers. Regardless of the seasons it’s advised that you carry a rain gear, a sleeping bag, gloves, a warm hat, walking stick, heavy socks, gaiters plus a first aid kit, in addition to gum boots. There are several Porters living around this mountain who will carry visitors’ luggage, equipments plus food, so that the visitors only carry a small bag containing their personal documents, camera, water plus some other small items. One may purchase their personal food plus Rwenzori mountaineering service may be offer cooking utensils as well as cooks to assist you. 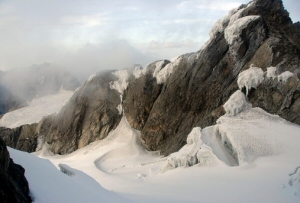 Make sure that you reach at the Rwenzori Mountaineering Services (R.M.S) and Rwenzori Mountains National Park head quarters found at Nyakalengija in the morning in order to have ample time to hire the hiking equipment as well as book for porter guide services. 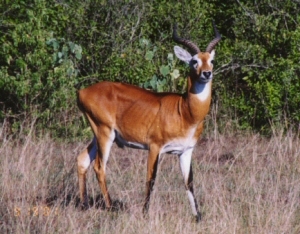 Hiking begins at 5,400 feet or 1,646 meters at the headquarters of the park going past the Bakonzo “mud & wattle” homesteads. Steadily continue hiking through the enormous elephant grass and ascend through the garden plots and this will take approximately 40 minutes to reach the park boundary. The trail follows the Mubuku river crossing through the latest landslide areas and involves climbing over a bluff plus rocks, ahead of arriving at river Mahoma in two and a half hours time. 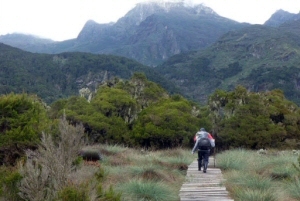 On crossing the river begin on a steep climb passing through the Podorcarpus Forest and the open bracken fern slopes at 8,700 feet (or 2652 meters) to the Nyabitaba hut. 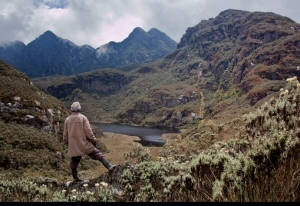 The climb from Nyakalengija region to Nyabitaba takes approximately 5 to 7 hours and the final elevation reached is 4,000 feet (or 1,200 meters). Slow or inexperienced hikers may take a longer time, for that reason it is recommended to depart from the headquarters of the park as early as you can to avoid moving in darkness. Throughout this safari, you may hear chimpanzee sounds and if lucky see the Rwenzori Turaco bird, the blue monkeys as well as the black & white colobus monkeys. The trail begins at Nyabitaba Hut heading westwards and for half a kilometer and then steeply drops to the Kurt Shaffer Bridge. Here you cross below river Bujuku and river Mubuku and turning right of this bridge, begins ascending up the central circuit in the anti-clockwise way because the reverse direction is more challenging and risky. The slippery muddy trail consistently ascends through the bamboo forest past the Kurt Shaffer Bridge. After one and a half hours, you will reach the most demanding and risky part of the circuit as stated by most hikers because it has slippery boulder leaping. You will arrive at the Nyamuleju hut which is associated with the rock shelter just after 5 hours of hiking from Nyabitaba and actually this could be a wonderful stop for an overnight. This is the s of the huge lobelia plus the groundsel zone, an exceptional vegetation type that can’t be seen elsewhere on the planet, except at Rwenzori. You’ll have an hour’s walk in a challenging swamp to John Matte hut (at 11,200 feet or 3,414 meters). It is bursting of exceptional plants and fortunately the slow pace at which you move will offer you the opportunity to observe as well as photograph this beautiful surrounding. Arriving at john matte will take 7 hours. Some hikers consider this to be the most tiring as well as the longest day of this trekking circuit for that reason; we suggest that you begin early. At the peak of the Kurt Shafer Bridge you will be at an altitude of 3,000 feet or 915 meters. To those Hikers who may feel that they have reached the peak of their limit can actually stop at this point. from John matte you will cross River Bujuku and go through the lower Bigo marsh in which you shall actually experience leaping from one tussock to another on a grassy marsh. Not only is this trail muddy but it also follows the left (which is the southern) border of lower Bibo marsh until it ultimately reaches a round metal “the uniport” which is a bigo hut plus the rock firm shelter. You will find a steep area after the hut on your way to the upper Bigo marsh on your final half for which a walkway has been built. Someone could imagine that it is an unattractive intrusion; however it makes walking easier and prevents hikers from further damaging this bog. At the upper end of this bog is a beautiful narrow stream that can make a lovely stop over for your lunch.